Due to the extra time and packaging involved in shipping binding, the minimum order is 2 sets of binding. Due to the very high cost of shipping from Hawaii, and experiences with loss/breakage, I only ship to the Mainland U.S. and Japan. Priority Mail anywhere in the U.S. for 1-6 sets is $20.00. To order contact pegasusguitars@hawaiiantel.net. and tell me where in the country you are located. I'll calculate the shipping and send you a PayPal invoice. Guitar Binding- Minimum size 2.3mm thick x 7mm tall x 820mm long. Ukulele binding- Minimum size is 2.3 mm thick x 7mm tall x 510mm long. ​Binding sheets for laminating your own purflings on for side purfling.--These are not always available. When available they will be random widths from 2" to about 4". Just depends on what I have. Size is 1/4" thick x 32+" long with the best curl on the 1/4" side. ​All bindings in a set are cut from the same piece of wood for a great color match. There is a wide variation in koa colors though. If you order more than 1 set of bindings, I will normally send you sets from different wood to give you some choices. Lighter colors generally have more "flash" and darker bindings are slightly more subdued. Both will be very curly. You can specify lighter or darker colors and I will try to match your request. Prices shown are for guitar sets. Ukulele bindings are the same cost, even though they are shorter, but you can sometimes save considerable amount in the shipping. Guitar bindings are available in curly mango and curly koa. 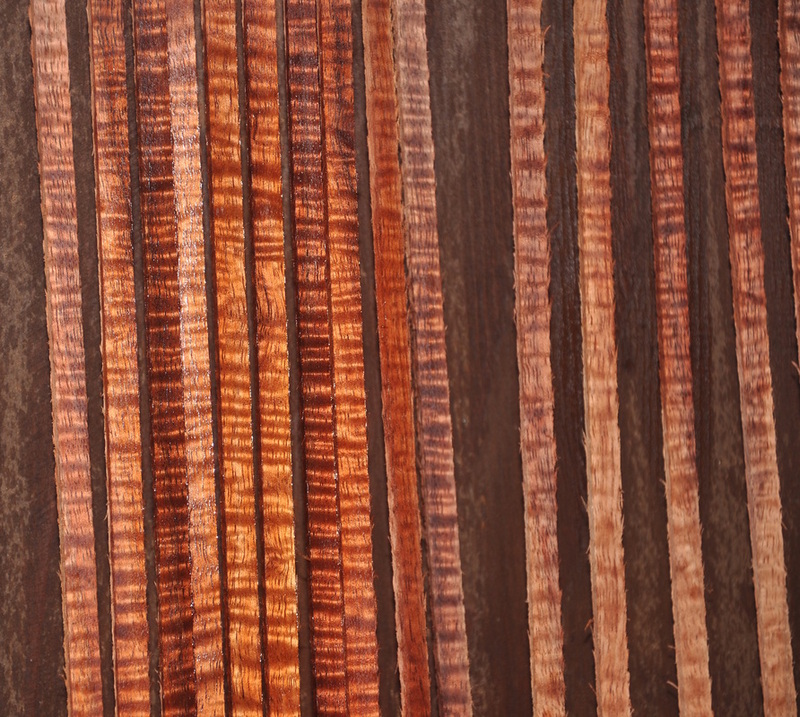 Ukulele bindings are available in curly koa, milo, Indian rosewood, and ebony. All pricing is the same. Sheets for laminating your own side purflings onto, when available, $18.00 per inch of width. 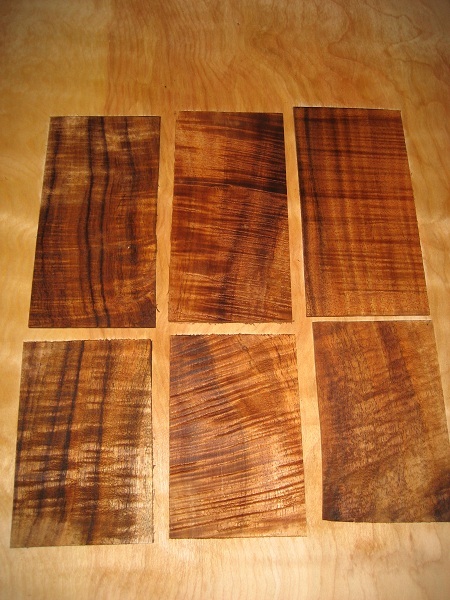 Due to the defects in koa, theses are difficult pieces to come up with. 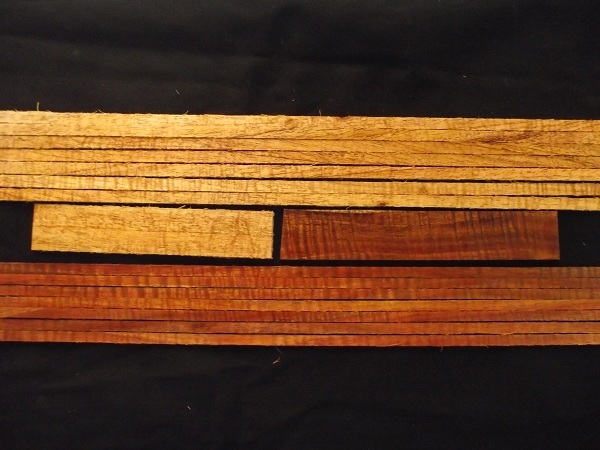 The photos below are representative of the quality of curly koa binding that I sell. It is impossible to show photos of individual sets, because my supply is constantly changing as I make binding from different pieces of wood. When you order binding, if you want to, you can indicate if you would like darker or lighter colors and I'll do my best to supply that. I can not match binding to specific colors. Just too many varieties of koa to do that. Dyed Fiber Purfling-- The industry standard. My purflings are longer than usual.